heavy duty Single row Crossed roller crane use slewing bearing,High precision, high speed, long life, high reliability, high temperature resistance. WJY slewing bearings can be divided into the following types according to their structures as single row four point contact ball slewing bearing, single row cross roller slewing bearing, double row different ball diameter slewing bearing, three row cylindrical roller slewing bearing and roller/ball combination slewing bearing. These types of bearings can be further divided into bearings without gears, bearings with external gears and bearings with internal gears. This kind of bearings has high load carrying capacity. 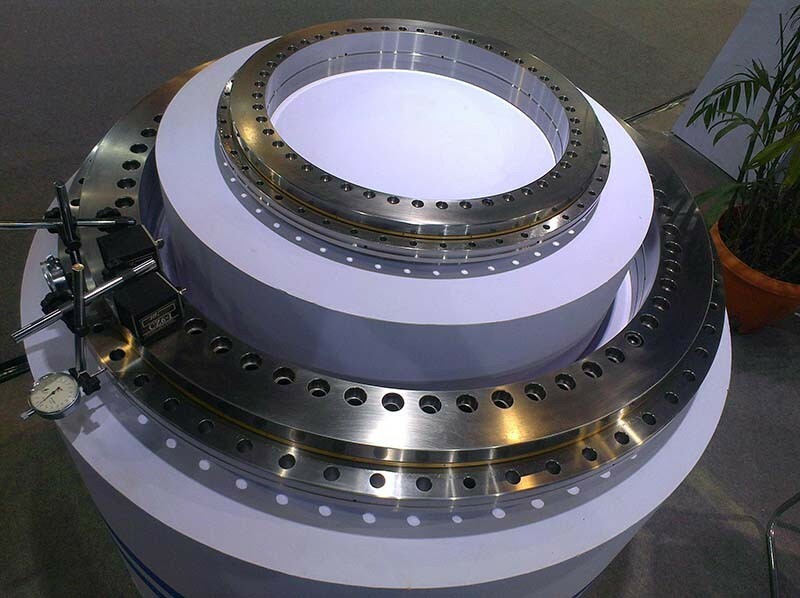 Under same loads, this kind of bearings has much smaller diameters which can make the installation much compact, as different kinds of loads are supported by different races and rollers.Main applications of this kind of bearings are hoisting, mechanical handling, mining and materials-handling, offshore technology and general mechanical engineering etc. Application Metallurgy, Rolling Mill, Mine, Oil exploitation, Paper-making industry, Sugar industry, and so on. Feature High precision, high speed, long life, high reliability, heavy load and high temperature resistance. All the materials are from the best suppliers in China. We can provide light chamfer, black chamfer, black chamfer of the rollers. The bearings are produced all according to customer’s requirements. 1) Most competitive price and good quality. How does your factory control the quality? All the bearing parts are 100% strictly inspected before and during production including Metallurgical testing, crack detection, roundness, hardness, roughness and geometric dimensions. All of bearings meet the ISO international standard. Our factory is located in Wafangdian city. The address is Aera B,Taiyangyuanbao Industrial Zone, Wafangdian city, Dalian city, Liaoning province, China. You can fly to airport directly. All our customers, from home or abroad, are warmly welcomed to visit us!